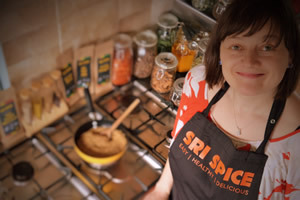 Inspired by the aromatic dishes she ate while living abroad, Thea Samuel returned to the UK and launched her own business, Sri Spice Ltd, in 2015. Based in North Queensferry, the business sells Sri Lankan style curry kits and side dishes that are made to the 42-year-old’s own recipes. Whilst living and working in Sri Lanka in 2007, I stayed on my own as well as with a lovely local Sri Lankan family. Amma (mum) cooked the most amazing curries on an open fire with clay pots. The food was so fresh and so healthy I don’t think I’ve ever looked or felt as good as when I was there. After coming back to live in the UK, I started experimenting in my kitchen whilst on maternity leave, and after a lot of taste testing I produced my Sri Lankan style curry kits and side dishes to sell in 2015. My children are half Sri Lankan, so I also thought it would be a nice way for them to keep in touch with their Sri Lankan side whilst growing up in Scotland. A lot of hard work, support from family and just making it up as I go along! My mum has been a massive support - she helps make samples, pack spices, proof reads, babysits etc. Her husband, George, puts labels on bags for me too. My dad and brother also do a lot of babysitting, so I can attend sampling events. Help from Business Gateway Fife has allowed me to attend trade fairs and I soon, hopefully, get support through DigitalBoost. My business adviser, Fraser McKee, has been amazing. Start-up training through Acorn Enterprise in Rosyth has also been invaluable. I had decided to launch Sri Spice Ltd at Bankfoot Gala in May 2015, but the graphic design element took much longer than expected. I had nine kits with recipe cards and front and back labels. I ended up having to agree proofs at motorway service stations whilst coming back from holiday with the children, which was stressful and led to me not noticing a spelling mistake. I was far too busy trying to juggle everything. If I could do it again, I would have added in extra time for contingency planning or, at least, delayed the launch until I’d had enough time to triple check everything. Repeat customers are my biggest achievement - I still have many customers who have been buying my kits since I launched. Some have even spoken to shop owners about stocking my kits in their local area. It has been such a pleasure getting to know them. The benefit of making up my own original recipes is that people repeat buy because there are no other similar kits available. My hope would be to go back to Sri Lanka and speak to my old manager about buying ingredients, like curry leaves and spices, direct from the people with disabilities that he is trying to support. Most people in Sri Lanka pick curry leaves from a tree in their garden. If they could pick the leaves, dry them in the sun, and send them to me that would benefit us all. Yes. I have used agency staff previously for busy periods, but it would be great to be able to recruit people who love and know spices and have a keen interest in curry and cooking in general. Finding the time to get everything done! Especially the more boring but necessary jobs, such as the paperwork. Any advice to wannabe entrepreneurs? Speak to as many people as you can who are currently doing what you would like to do, or something similar. I’ve found that most people love speaking about their business and their experience can be invaluable. Determined, resourceful, cheerful, fun and tenacious! It depends on my mood really. I don’t get much time to watch films or even read books these days but, I’d say, film would be ‘Eat, Pray, Love’ and book, ‘The No.1 Ladies Detective Agency’ by Alexander McColl Smith. I don’t get much time to myself but when I do, I love to have a candlelit bath with some bath oil. It really helps me unwind and think through my day. If I have a bit longer, I love to get the train into Edinburgh and wander about, stopping for a coffee in a good book shop with a cafe.